Miley Cyrus played host on Saturday Night Live, as the long running comedy show returned to American screens yesterday. 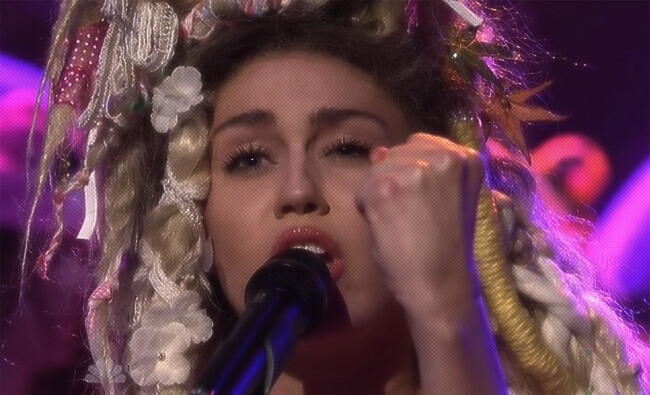 Not only did she host and star in some of the skits, but the Diva also gave two emotional performances of tracks lifted from her experimental (and free) album, Miley Cyrus and Her Dead Petz. An LP I still, shamefully, haven't gotten around to listening to! Whereas Karen Don't Be Sad saw the Diva remain in control, supported by band the Flaming Lips; The Twinkle Song was a different story. Alone with just a piano, Miley was in tears by its end, having sniffled her way through to the finish.